Large cattle ranches in Osceola County conserve a vast area of open lands – pastures, pine flatwoods, palmetto prairies and marshes – west of the St. Johns River. To the millions who visit Florida’s coastal beaches every year, the ranchlands are largely unseen or overlooked. To those who know them, the working cattle ranches of Florida are an anchor to the past, and provide a rich connection to the state’s heritage. The history is entwined with a diverse landscape, brimming with wildlife. Species such as eastern indigo snake, crested caracara, and red-cockaded woodpecker are found throughout the prairies and flatwoods of the Florida ranchlands. The nearby presence of the extremely rare Florida grasshopper sparrow and an experimental flock of whooping cranes on the Ranch Reserve BOT Project make a clear case for additional protection. The Ranch Reserve project seeks to acquire development rights from ranch owners to ensure that the majority of the acreage in this landscape will remain as it is today. This is usually accomplished through a conservation easement, which relieves the landowner of some tax burden while allowing existing agricultural practices to continue. The biggest beneficiaries of conservation easements are wildlife, which can flourish as habitat management and restoration efforts are applied, terms of which can be written into the easement. The protection of the Ranch Reserve project will preserve a connection of open land with the 62,000-acre Three Lakes Wildlife Management Area to the north and the 52,000-acre Three Forks Conservation Area to the east. The four cattle ranches in the Ranch Reserve project lie on the Osceola Plain west of the St. Johns River marshes. Mesic flatwoods interrupted by depression marshes cover about 40% of the project area. Swamps and hammocks make up much of the remaining natural communities. At least 24 Florida Natural Areas Inventory (FNAI)-listed animals are known or reported from the project. Protecting and restoring the mosaic of pine flatwoods and wetlands in this project is the central mission of the Ranch Reserve BOT project. Achieving this protection will provide refuge for its threatened inhabitants, such as the flock of whooping cranes that Florida Fish and Wildlife Conservation Commission has released in an effort to re-establish them. There are fewer than 500 whooping cranes left in the world. The experimental population is thought to number around 20 individuals. As of 2011-2012, 23,800 acres have been protected within this project, through the use of conservation easements on three large cattle ranches. St. Johns River Water Management District and FFWCC work closely with Florida Forever’s BOT program. Roughly 13,000 acres, spread over two additional private ranches, remains to be protected. 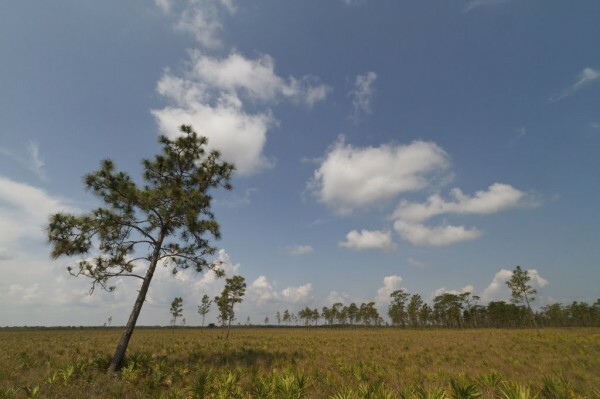 The property forms an important east-west bridge between two of Florida’s most significant watersheds: the Kissimmee River, part of the Everglades system, and the St. Johns River, which flows north up the Atlantic Coast to Jacksonville. In addition to the diversity of bird species benefiting from the protection of their flyway, this linkage could serve as a potential dispersal zone for terrestrial wildlife. Wide-ranging species such as the black bear or the Florida panther would need to navigate from the prairie ranchlands into the St. Johns River corridor in order to disperse north around the city of Orlando. This could one day prove to be their route.